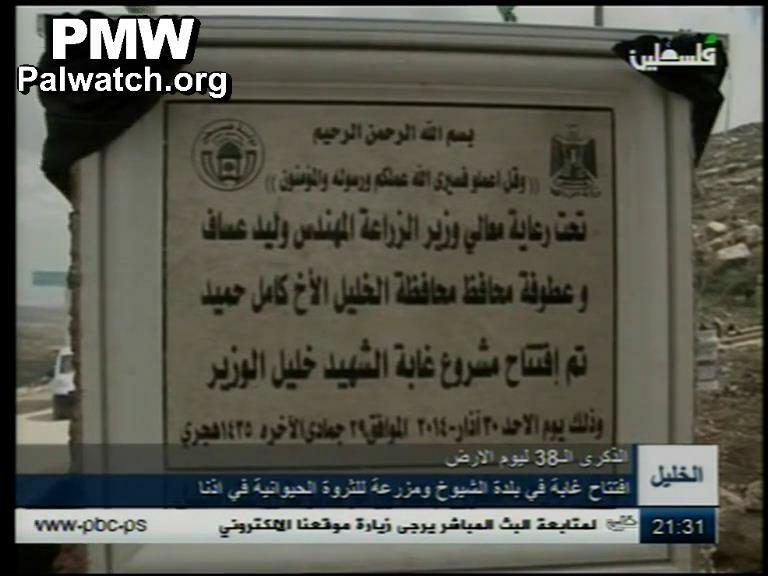 The official Palestinian Authority daily reported that the PA and Fatah inaugurated a forest they chose to name after arch-terrorist Abu Jihad: "The Martyr Abu Jihad Forest." Abu Jihad was a founder of Fatah and deputy to Yasser Arafat. He headed the PLO's military wing and planned many deadly terror attacks. These attacks, which according to the official PA daily killed at least 125 Israelis, included the most lethal in Israeli history - the hijacking of a bus and killing of 37 civilians, 12 of them children. Palestinian Media Watch has documented that PA Chairman Abbas decorated terrorist Abu Jihad post-mortem a few months ago with "the highest order of the Star of Honor." The inauguration ceremony was attended by several PA officials: Minister of Agriculture Walid Assaf, District Governor of Hebron Kamel Hamid and representatives of the PA Security Forces, as well as several mayors from the Hebron district and relatives of terrorist Abu Jihad, the paper reported. Official PA TV also showed footage from the ceremony. At the ceremony, the terrorist's son Jihad Al-Wazir stated, "All of you are Martyr Abu Jihad's children, and he is freedom in the memories and hearts of every one of you." Describing the event, the official PA daily reported that "everyone was asked to protect the forest, in view of its great significance, especially because it bears the name of a leader and symbol, Abu Jihad." 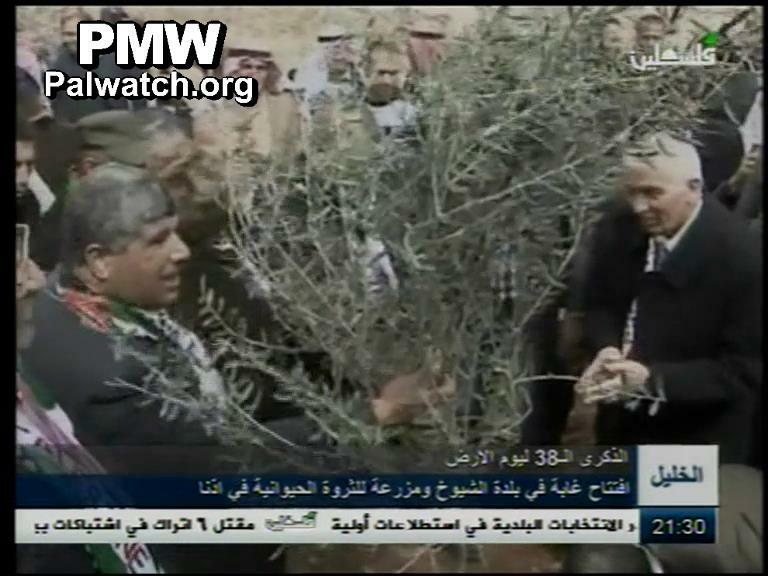 The Martyr Abu Jihad Forest project was inaugurated under the auspices of [PA] Minister of Agriculture Walid Assaf and Hebron District Governor Kamel Hamid on Sunday, March 30, 2014. 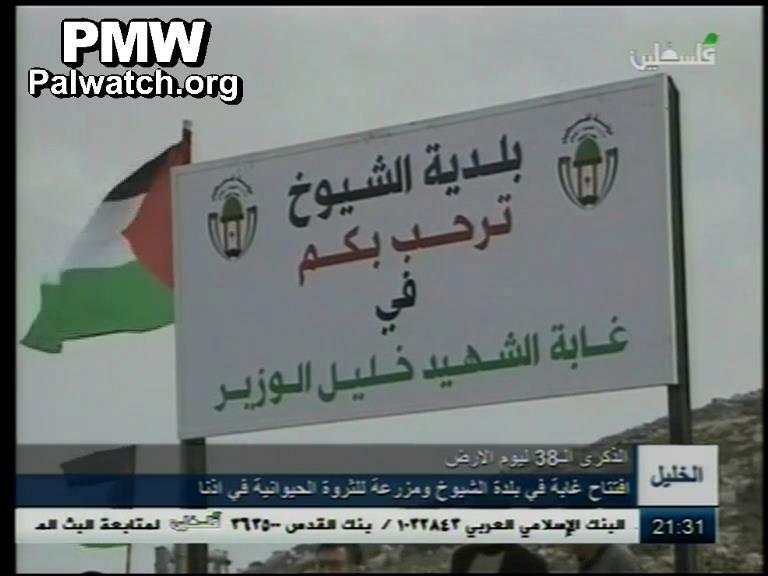 Click to see PMW's documentation of official PA TV's tribute to terrorist Abu Jihad last year. Minister of Agriculture [Walid Assaf] and District Governor Kamel Hamid... praised this achievement (the inauguration), which illustrates the meaning of unification and tenacity and resolve on our land..."
After the ceremony, [the participants] turned toward the forest, cut the ribbon and inaugurated it. They also planted trees in the forest, which covers approximately 24 dunams. Everyone was asked to protect the forest, in view of its great significance, especially because it bears the name of a leader and symbol, [Abu Jihad] Martyr Khalil Al-Wazir." "Many times, Abu Jihad made his way into the hearts of fighters in other countries - from the Sandinistas in Nicaragua and the Pattanis in Thailand, to the Iranians, with all their factions and [political] affiliations. I don't recall seeing or hearing about them and those like them from anyone besides Abu Jihad. The only times I ever saw them were at his places of work - from his office to the bases he would insist on visiting and inspecting... and his sole aim was to help them adhere to the principles of revolution and to recruit them to Palestine's side. In this, in his actions and influence, he is on a par with, or close to, the symbolism of Yasser Arafat and his keffiyeh (Arab headdress), the poetry of Mahmoud Darwish, and the blood of Dalal Mughrabi, Bajes Abu Atwan and others... Abu Jihad remained [active] on the ground from the start of his Jihadist activity in 1955 until his Martyrdom in 1988. 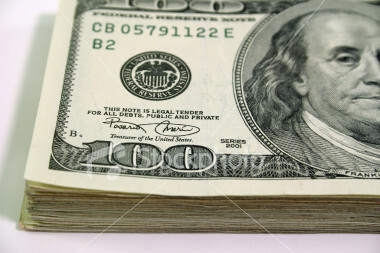 He was the spearhead of the bullets of the true resistors, and the first truly upright rock."